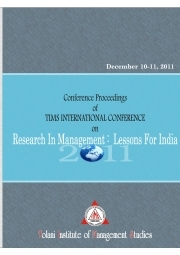 TIMS International Conference Proceedings on "Research in Management: Lessons for India"
Description of "TIMS International Conference Proceedings on "Research in Management: Lessons for India""
This book is a collection of the accepted papers of the TIMS International Conference 2011. It includes the latest findings and research works of management professionals, academician, researchers and management/research students from around the world, which covers different themes in the field of Management Research. This book is suggested to Management Professionals, Students, Academics, Professors, and Researchers. Reviews of "TIMS International Conference Proceedings on "Research in Management: Lessons for India""